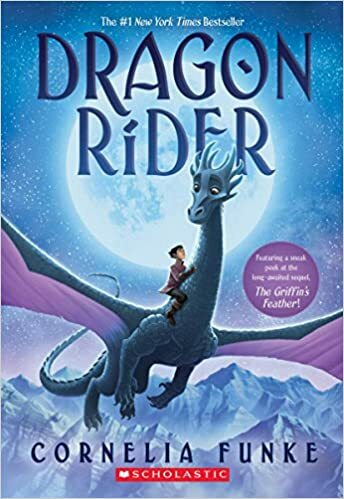 Description: With a lonely boy named Ben on board, the brave young dragon Firedrake sets out on a magical journey to find the mythical place where silver dragons can live in peace forever. Flying over moonlit lands and sparkling seas, they encounter fantastic creatures, summon up surprising courage -- and cross the path of a ruthless villain with an ancient grudge who's determined to end their quest. Only a secret destiny can save the dragons in this enchanting adventure about the true meaning of home. My Thoughts: When humans threaten to invade their isolated valley in Scotland, young dragon Firedrake listens to the oldest dragons story about the Rim of Heaven, a magical place where dragons can be safe. Firedrake, along with his cranky brownie Sorrel, are determined to find it and find a a place of safety for the dragons to live. Rosa Rat suggests that they check with her cousin Gilbert who is a famous mapmaker in the warehouse district of a human city. When Firedrake and Sorrel arrive in the city, they hide in a warehouse where Ben, a young homeless human boy, has been living. He helps them find Gilbert and joins them on their journey. The quest to find a location that may or may not be legendary would be difficult on it own. But the adventurers also have to deal with Nettlebrand who is an evil, golden-armored monster who wants to hunt down and kill all the silver dragons like Firedrake. Nettlebrand has created magical ravens to be his spies and he also has a homunculus named Twigleg who has been his armor polisher for hundreds of years. Nettlebrand sends Twigleg to spy on the adventurers but he very quickly joins them because they treat him with kindness and respect. However, Nettlebrake has a new armor polisher in Gravelbeard, a dwarf, to be his new spy. As the adventurers travel to the Rim of Heaven somewhere in the Himalayas, they encounter friends like archaeologist Barnabas Greenbloom, his daughter Guinevere, and wife Vita who help them on their journey. They also encounter more dangers including a basilisk and sandmen and a roc that captures Ben. This was a great middle grade adventure. I liked how so many of the characters were searching for a place to call home. I also liked the friendships that were developed between all the various characters. "He's helped us, Sorrel. He's a friend. So I don't mind whether he's a human being, a brownie, or a rat. What's more," he added, looking at Ben, who was standing there hardly daring to breathe, "what's more, he doesn't have a home now any more than we do. Isn't that true?" He looked inquiringly at the boy. "I never did have a home," muttered Ben, looking at Sorrel. I received this one in exchange for an honest review from Scholastic Books. You can buy your copy here. I like the sound of this too. I will suggest it to my granddaughter. I did find it in my Audible Wish List.